Far west Texas is a desert land of isolated mountain ranges and vast empty plains, crossed by few roads and lacking many obvious attractions, though there are three NPS units - Big Bend, Guadalupe Mountains and Fort Davis, a National Historic Site, preserving the remains of an important fort in operation from 1854 to 1891, along what was the only road between Franklin (now El Paso) and San Antonio. Today, several dozen buildings remain, scattered over a spacious site of 474 acres, at the foot of a cactus-covered volcanic mesa at the edge of the Davis Mountains, next to a small town also named Fort Davis, and reached by highway 17 between Marfa and Pecos. 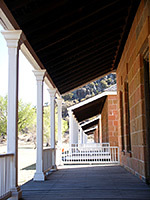 At the entrance to the NHS is a museum and visitor center, from where visitors can take a self-guided tour around the fort grounds and inspect the various structures, which are a mixture of restored buildings and foundations; a longer trail loops across the rocky slopes beyond and another climbs further into the hills and links with the adjacent Davis Mountains State Park. 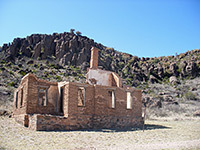 The main purpose of Fort Davis was to protect travelers from attacks by roving groups of Apache, Kiowa and Comanche during the Indian Wars, a role fulfilled in two periods; firstly from 1854 to 1862 when the base was small and primitive (only a few foundations remain from this time), and then from 1867 to 1891 when all the surviving buildings were constructed. At its peak the fort contained more than a hundred structures and was home to over 400 troops, including some of the first 'Buffalo Soldiers' - cavalry and infantry units composed entirely of African-Americans. 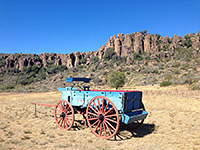 The National Historic Site is situated on the north edge of Fort Davis, along a side road opposite a small selection of curio shops and other tourist-centered businesses, including a rattlesnake museum and a military-style motel. The fort itself has a distinctive appearance, bordered by the steep-sided mesa of dark volcanic rocks, and with its small buildings (most are single storey) quite well separated, slightly dwarfed by the wide grassy surroundings. The entrance road crosses an old dirt track, the exact course of the original Franklin-San Antonio route, these locations being 200 and 400 miles away respectively. Most buildings at the fort are either complete and fully restored, with modern windows, doors, roofs, etc, or just wall remnants about one foot high, and even these have been partly reconstructed. 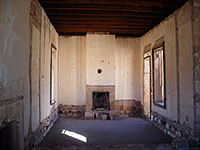 A few are in an intermediate stage of repair, such as several two-storey officers quarters on the north side of the compound, which are lacking roofs and some parts of the upper walls. 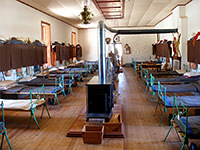 Five buildings (barracks, commissary, officer's kitchen, shared lieutenant's quarters and commanding officer's quarters) are furnished as they were in the 1880s, with authentic though not original contents, while the rest of the outwardly intact structures are empty, most with original, unaltered walls and flooring (all have modern roofing, however). Graffiti from early 20th century visitors is found on many of the walls, dating from before the NHS creation (1961), when people were allowed to wander more freely through the buildings; now all rooms are fenced off. the next (also a barracks) is fully furnished with beds, lockers and military equipment. Two of the officers' quarters on the far side of the parade ground (part of a long line of buildings named Officers' Row) are also furnished, and seem very comfortable, even by today's standards. The most distant structure, well away from all others, is the hospital, which is in the process of a full restoration but already has a collection of medical equipment and other historic artefacts. Less construction survives on the east side of the site - buildings like the bakery, guardhouse, chapel, signal office and regimental band barracks are now just foundations, as are the large cavalry stables and quartermaster corral to the south. The other furnished structure is the commissary, where rations were stored and issued. The NPS provide frequent recordings of bugle calls throughout the day, and stage historical re-enactments in summer, both of questionable merit, but despite this, and the large amount of restoration, the site is highly evocative and authentic, deserving of a half day visit in order to see all the various exhibits. A 0.3 mile trail starts behind one of the two storey officer's residences, climbing the hillside beyond and becoming quite steep near the top where the ascent is aided by stairs and metal railings; it leads to a good viewpoint of the whole complex and the town just beyond. The return can be via a longer (1 mile) path to make a loop, re-entering the fort near the hospital building. Another branch climbs a little further, up a valley to the end of the scenic drive in Davis Mountains State Park. Chihuahuan Desert plants on the cliffs include agave, sotol, nolina, yucca, opuntia and big clumps of echinocereus coccineus (claret cup cactus), the latter festooned with brilliant red flowers in spring. Fort Davis has a few motels; the nearest places with chain lodging are Alpine (24 miles) and Pecos (74 miles).